6.53 points at 17 votes (rank 500). In the far away future, the year 3028, fierce wars rage in the universe. The five big dynasties are partially allied, but most of the time they fight each other to the finish. The by far most important weapon in the wars in these times is the so-called Mech, a huge, heavily-armed machine operated by humans. The brave pilots carry out the fights daily at land, in the water, in the air and in space with Mechs of different types. One of the groups, the Lyran Commonwealth is ruled by the powerful dynasty Steiner. This organization of states is defensively oriented concerning the military, the official language is German (but the game is in English) and the current matriarch is Katrina Steiner. Due to the forthcoming marriage of the daughter, Melissa Steiner, with the partriarch Hanse Davion, ruler of the federation "Federated Suns", a league is in the process of being created, which is supposedly going to make Steiner practically unattackable. 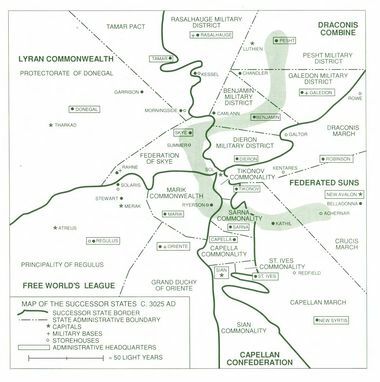 This is good news for the inhabitants, because the threat from hostile dynasties, especially the Kurita and their Draconis combine, is big. 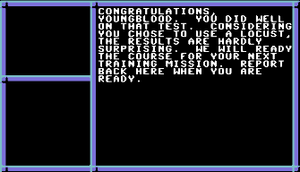 In this role play game you take the role of Jason Youngblood, in his capacity of cadett, in a training centre for Mech warriors. 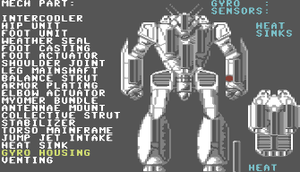 The hero of the game is also the son of Jeremiah Youngblood, the security boss of the Steiners, one of the best Mech warriors of all times. The game starts on the verge of Jason's first practical training in a Battle-Mech. The training centre resembles a small town with accomodations, Mech workshop, hospital, weapon and armour shops and even a stock market. Here, Jason can raise his abilites in the skills of bows and bladed weapons, pistols, guns, medicine and technique, and of course also his abilities as Mech pilot and fighter. When his training is finally complete, he will be sent to missions in the combat zone. Depending on his success he will of course rise in the military ranks. If you make it to survive some fights, then you can even request for a holiday on a wonderful recreation planet. Such nice things are described in the enclosed manual. After a surprise attack from the hostile Kuritans the training centre is reduced to ashes. The half-trained Jason is on his own terms. There is nothing left for him to do than to explore the surroundings and search for the Starport, the next biggest city. On the way there you are often attacked by Kuritan soldiers and Mechs, you can fight against them or flee. After arriving in the Starport you will notice very quickly that here also danger is everywhere, Jason is still wearing his cadett uniform and it is teeming with enemies. After getting new, civil clothes you can start to pound the hospitals to find injured friends. You will find a good friend of the famous father rather quickly, Rex Pearce. Everything is here, from knife to flamethrower, happiness ensues! The game graphics are kept functional. 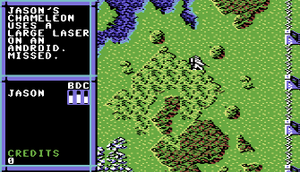 The bird's view is useful and also indicates that BattleTech is based on a tabletop game. Some game scenes, especially during the fights are shown with animations. These are kept in the Manga style. The title screen is accompanied by music. In the game itself music would be disturbing, there are only sound effects. The fights are turn-based. You enter movements (go, walk, jump) and choose a target for the weapons. Then Jason's team and their enemies swap shots. This is done until one side is eliminated or has fled. It is disadvised to use the automatic fight mode, in which the computer calculates your actions. Both in the C64 and in the PC and Amiga version is the suggested tactic not the best. When you are far superior, however, you can by this extremely shorten the partially rather time-consuming fights. - Return to Game: leave the menu again. - Change Game Settings: change the settings as e.g. walking speed. - Inspect Character: view the values of a character or a Mech. - Heal Characters: in certain intervals you can treat the wounded this way. - Load Game: load a saved game. Six games can be saved. - Save Game: save a game. - Show Overhead Map: shows the map with all explored places. - Move: Here you set how the character should react in the fighting round. - Clear Moves: delete chosen route. 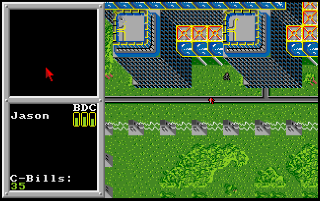 - Computer: the mobile combat computer at the character's wrist suggests a tactic. - Scan Unit: take a look at the enemy and also scan Mechs if available. You can also look for allies. - Next Unit: switch to the next allied unit. - Flee: a try to escape the fray. - Beginn Fight: the fighting round starts. - Walk: With this you steer the Mech on a certain course. - Run: For getting there faster, but there will also be more heat. - Jump: If a Mech has jumpjets he can jump over obstacles and save time. - Clear Moves: deleted chosen walking, running or jumping route. - Use Weapon: here you can set a target for each single weapon of the Mech. Splitting pays off with simple enemies and especially infantry. - Kick: Mechs can also kick other Mechs to cause damage. Against a single person the word "scrunch" is problably more to the point. - Computer: The board computer suggests a strategy. - Scan Unit: Either let the own Mech or the enemy get analysed by the computer. - Begin Fight: the fighting round starts. Before the training missions there is a short theoretical exam, you will be asked about the parts of a Wasp-Mech (a password query as copy protection). 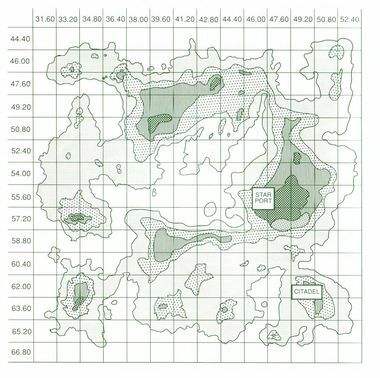 You also need a star map (see maps), which was enclosed to the original game, for the final in the "Star Cache". This is a second copy protection integrated in the game. In the games collection Power Hits Compilation this map was missing and the game could not be ended. The stock trading is easy to see through. While the shares from the companies "NasDiv" and "DefHas" only rise slowly, but hardly fall, is the enterprise "BakPhar" known for extreme fluctuations. On the long run you should therefore invest evenly in the first two papers. BakPhar is well suited for cheating quickly some C-Bills with the tactic "save, check, maybe reload". In Mech workshops you cannot only absolve a technical internship or get your machines reparied, but you can also buy ammunition for machine guns and missile launchers, in addition some Mechs can be tuned. With more and above all better weapons and a pimped armour the fights get significantly easier. Unfortunately, there are also irreparable damages. This is especially annoying with the captured Mechs, as these almost always have such defects. Although the Mech that is rented in the arena is most of the time a weak Locust, it makes sense to decide for it. The own machines can easily carry away defects at the heat shields; reparing that costs 800 C-Bills and significantly surmounts the price for the victory of 500 C-Bills. 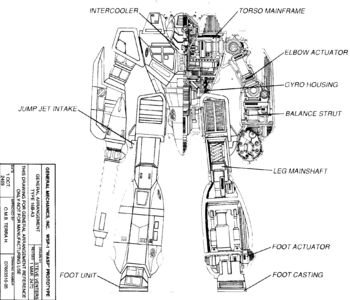 Different types of weapons are used in a Mech fight. By editing savefiles (cheating) you can even get access to further weapons, as e.g. a flamethrower. The terrain that you can explore is very big. The game has auto-mapping. Every now and then the game needs to load. As long as you are in training there is pocket money in certain intervals. But this is only if you do something, if you are only standing around, you are not going to be paid. You get bigger amounts by speculating at the stock exchange. Later, when the fight against the Kuritans is running, you can bolster up your money by selling the scrap of the defeated hostile Mechs. If you equip Jason with an Inferno as a weapon before training mission 7, you can completely save yourself the expensive training in fighting skills in the citadel. The flamethrower only makes deadly hits on foot soldiers. Several characters can severely disturb a Mech with this weapon by overheating. Jason can raise the skills "Medic" and "Tech" only to the level "Amateur". There is not more to get from a first-aid course and an intership in a Mech workshop - and the main hero really has not the time for studies at a medical or technical university. In the course of the game you can little by little put together a good team. A doctor, a technician and further Mech pilots wait for you to be found. But beware, also Kuritan agents lure around and want to smuggle into your group! If you shoot around wildly with hot weapons as laser and PPC without thinking, you do not have to be surprised when the Mech overheats and the machine switches off for a short time. A cool-down can be done by manoeuvring the Mech into a sea. You should never turn your back on a hostile Mech, an (un)lucky hit into the rear section can be enough to degrade the exorbitantly priced fighting machine to a heap of scrap. The enemy's strength in the random encounters adapts to the strength of the player's troup. If you stump around with several Mechs, then a whole Kuritan unit will attack. If you are on foot, you will also only be attacked by infantery. There are different types and classes of Battle Mechs. Three of them, the models Locust, Wasp and Chameleon are available to Jason in the training centre for his training missions. If a Mech has a clutch or not is only important in the second training mission. In the remaining course of the game this is not needed any more. Mechs that you meet in the random encounters can be looted. Here you can find Locust, Wasp, Stinger, Javelin and Spider. In the section "General" you find the parts of a Mech which are asked before each training mission. Some of the Mechs can be upgraded in the "Speed Shops" of the Mechit-Lubes. In the fights in the arena you can probably get more or less all Mechs as an opponent except for the Chameleon. 1 Medium Laser A fast and agile Mech with weak weapons and light armour, well-suited as a scout. A brand-new Locust has a value of 1,5 million C-Bills. If you rent a Mech in the arena, you almost always get a machine of this type, it can also often be met as an opponent. The Locust is very well suited for the first training mission but has no clutch and is therefore useless for the second mission. 1 SRM-2 One of the significantly weaker Mechs, it is similarly armoured as the Locust. In return, the model is easy to get and indeed useable after an upgrade. It is available as training Mech in the training centre but is not recommended for any mission. 2 MG The only middle-weight Mech in the whole game, all other available types belong to the light weight class. There is only one chance to get possession of a Chameleon, you need to escape the first attack of the Kuritans with it (four Jenner Mechs), which is easy to do. The difficulty grade of the game drops by this especially in the beginning phase. Except for Jason's training machine, no other Mech of this type is in the game. It is recommended for all training missions, except for the first, as this is only about speed and not fighting power. 2 MG With proceeding plot Jason will get the possibility to steal such a Mech - or more precisely, he retracts it. It can be met often. Its light armour corresponds to the one of Locust and Wasp. The Stinger can be tuned and has then some fire power. 1 SRM-6 You get a Commando in the course of the game. Otherwise, this type only occasionally appears as an opponent in the arena, therefore there is probably no possibility to get a second one. Compared to the other Mechs the armour is medium. It is possible to modify the Commando and to upgrade it to one of the best Mechs in the game. 1 Autocannon-10 In very rare cases you get an UrbanMech when you rent a Mech in the arena. The probability to get a Locust is roughly estimated 50:1. This is the chance to grab the machine. Allegedly, this only happens when you have lost both the Mech from the citadel and Rex's Commando (comment from Shmendric: I have never received an UrbanMech in numerous tries with different conversion, I hope this is not a rumour). This is a very well armoured 30 ton machine that has an enormous reach and fire power. If you steal a rented Mech from the arena, two Kuritan UrbanMechs appear that try to keep Jason from escaping. In this fight you can also loot the hostile Mech, if you still have a free pilot despite the stolen Mech. But you are not allowed to leave the arena, you need to defeat the two UrbanMechs with the rented Mech, so usually a weak Locust -- Next to the four Jenners after the Citadel invasion this is probably the most difficult fight in the game. If you play with emulator you can of course save after every successful fighting round, or reload when it goes bad, to cheat an UrbanMech. 1 SRM-4 After the surprise attack, Jason faces four Kuritan Jenner Mechs. To win this fight is extremely difficult. In this fight you cannot loot a hostile Mech, because you do not have a free pilot. Later you only meet Jenners in the arena. Therefore it is very probably not possible to get a Mech of this type. It is well armoured. JAVELIN 30t no no no 2 SRM-6 This Mech only seldom appears as an enemy. You can meet it in a random encounter and as opponent in the arena. It has a rather good armour. SPIDER 30t yes no no 2 Medium Laser As the Javelin, the Spider is also a rare appearance at random encounters and as an opponent in the arena. It is armoured a bit better compared to the types Locust, Wasp and Stinger. PHOENIX HAWK LAM ? yes yes ? 2 Medium Laser, 1 Small Laser, 2 MG The Mech of Jeremiah Youngblood is found towards the end of the game. Unfortunately it cannot be used. LAM is for "Land-Air-Mech". 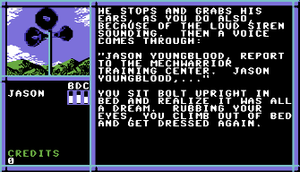 The values given here are taken from the game (C64 version) and differ from the board game rules, on which it is based. Laser no Exists with short, middle and wide reach. They create much heat but cause a lot of damage when hitting. SRM yes Short for "Short Range Missile", this missile launcher is available with different capacities and fire power. Autocannon yes A weapon that is similar to a tank cannonry from today. The reach and penetrating power are enormous. Machine Gun yes These are the most popular weapons also at the beginning of the 4th century, because they do not strain the Mech with heat. There are a lot of further weapons contained in the programme code. With the help of a hex editor you can also experiment with them. Lounge: In these buildings you can do a little smalltalk with acquaintances. This also works with total strangers. Armor Shop: Here you can buy different armour for different purposes. You can also get damaged armour repaired. Mechit-Lube: That you can learn something here is more a side-effect. It is more important that you can get Mechs repaired, buy ammunition and make tunings. Weapon Shop: In the weapon shop you can buy weapons. Which is what you might expect. Hospital: Here you can seek after your father, buy medical equipment or make an internship. Of course you can also get treated. Clothes Shop: ´Civil clothes are helpful if you do not want to attract attention unnecessarily. Barracks: Jason's current home. The cadetts of the citadel live here, talk to each other or have a short nap. 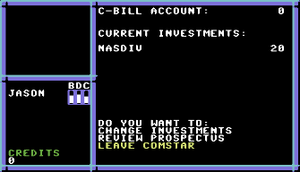 Comstar: There are three Comstar buildings on the island, one of it in the citadel and one in the Starport. Here you can buy and sell stocks of three big companies. Citadel: The main building of the citadel also carries the name Citadel - here can you can see many interesting things, you can meet the ruler Kathrina Steiner or make courses in different weapon fighting disciplines. Jail: North east of the Starport is a jail compound. After meeting Rex, you should search for further Crescent-Hawks, also you can loot a StingerMech here. Arena: The highlight of each Mech pilot is a victory in the famous arena of the Starport. Whether with an own or a rented Mech, you can really whoop it up and along the way maybe earn some C-Bills. Mech Garage It is not allowed to walk around in the Starport with Mechs. For a small fee, which is due when leaving the Starport, you can park your fighting machines here under surveillance. Inaugural Hall: Can only be found in the Starport and is important for the plot. It should better not be entered in military clothes. Frobs Electronics: Unfortunately, the for the plot urgently needed holodisk player is sold out in all the stores of this electronic market chain for months. In return you can buy a mapper here. Cinema: An exciting movie in the cinema calms down the nerves of a stressed Mech warrior. Gouverneurs Hut: During a small burglary you cannot find much more than a newspaper and a holodisk player. Inventors Hut: The domicile of the famous Dr. Edward Tellhim. In armour and weapon shops you can prepare yourself for the imminent dangers. Further equipment can be found in electronic markets or hospitals. - Flak Vest: a light protective vest. - Flak Suit: a light protective suit. - Ligh Env. Suit: an improved protective suit. - Heavy Rnv. Suit: A heavy full body armour. - All Terrain Mapper: You can buy this for much money in electronic markets. The use is not clear. The automapping also works without this item. - MedKit: A first-aid-kit to attend to wounds. - Field Surgery Kit: With this doctor's bag an effective medical treatment is possible. Depending on how good a character masters a skill, he has a classification as "unskilled", "amateur", "average", "good" or "exellent". Bow and Blade: This fighting skill can only be learned in the citadel. Pistol: Also the training with pistols can only be done in the citadel. Rifle: Here the same is valid as for the other fighting skills, you can only raise it for C-Bills in the citadel. Mech Piloting: In the course of his training missions Jason's skill will rise. This ability needs to be at least "amateur" to be able to sit behind the steering wheel of a Mech. Raising this skill is only possible during the Mech training in the citadel. Mech Gunnery: The ability to handle Mech weapons is useless as long as you are "unskilled" as pilot. Also this skill is raised only during Mech training. Tech: If you repair your Mech yourself and also know something about stripping of damaged Mechs, you can save a lot of money. Medical: Much cheaper than constantly visiting the hospital is to have an own doctor in the team. The attributes reflect the physical and mental basic values of the different characters. They are fixed and given and cannot be raised in the course of the game. Body is for the physical constitution. The value sinks with wounds and can be restored by attenting to them, in best case by a doctor. Dexterity. Reflexes and movement are needed both in Mech and in normal fights. Charisma is important especially for the officers amongst the Mech pilots. This value is for executive abilities. Divide all C-Bills equally to DevHas and NasDiv shares. You can neglect the training in weapons, same as the Mech workshop and the hospital. The only reasonable purchase before the Kuritans attack is an "Inferno" from the weapon shop. If you have too much money left, you can also buy an armour now. Between the training missions you are required to visit the barracks and the lounge. The surprise attacks start between mission 7 and mission 9. After the attack you should instantly go to the Starport, the arrow on the map shows the right direction (an electronic component that Jason received as a gift). First, buy new clothes there, then enter the Inaugural Hall. Before you enter a second time, some time has to pass, a Mech fight in the arena would be a possibility. Then go back to the Hall and survive in the following an exchange of fire together with Rex Pearce, who you track down there. Finally, ask for the medical files in the hospital and ask for an internship of the Mechit-Lube, where Crescent Hawks could be found. After visiting the jail in the north east of the Starport, there is another man in the team and maybe a new Mech. One member of the team will turn out to be a traitor, he should not be placed in control of a Mech. If you have finally, next to Rex, also a doctor and a mechanic in the team, they are both sent to a training course. If the team is not complete, you need to search further Mechit-Lubes and hospitals, before you head to Dr. Tellhim's artificier workshop. Before you do this, you need in any case make a detour to the ruins of the barracks in the destroyed citadel. To get through to Dr. Tellhim, the characters need to correctly answer question to different topics (technic, medicine and one question about the Battle of Mallory). Therefore it is very important that you find a doctor and a technician that can answer these questions. But the two only know the correct answer when they have made an internship before in a hospital or respectively in a Mechit-Lube. Rex answers the question about the Battle of Mallory. When all questions are answered, you finally meet Dr. Tellhim, who repairs the defect holodisk and also provides a player for it. As soon as you have the password, you can set out to the Cache, which is southeast of Dr. Tellhims in the middle of a stone desert. With the help of the map and the following codes for the doors it is now very easy to solve the rest of the game. The following door codes are built up like this: First, a number is given, that you find also on the plan. It gives the order in which the doors need to be opened. Then you see the colour codes and the corresponding number. When you have opened all doors, you should first search the Mech of Jason's father, which is hidden in a secret passage. Then go through door 10 and search the Cache, which lies in the back corner. Now go through door 8 and at the back where the computers are activate the power supply for the Hyperpulse Generator. 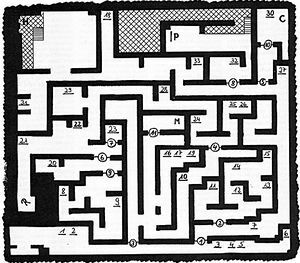 Now walk back and through door 11 into the Map Room. There, the following planets are clicked, that are needed as a password for the door: PESHT, BENJAMIN, SKYE, SUMMER, RYERSON, KATHIL and ACHERNAR. The ending leaves open many questions, but there are clear hints to a planned sequel. 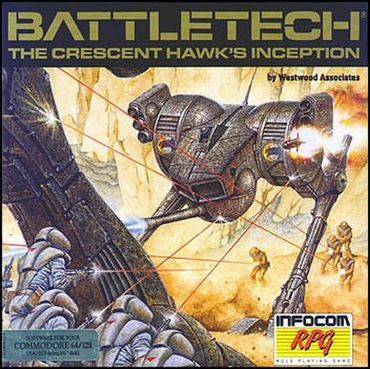 It was released under the name "BattleTech - The Crescent Hawks Revenge". The role play elements were cancelled in favour of significantly improved strategy elements. There is no C64 conversions. The files G0 to G5 on the SECOND disk side are the SAVEGAMES (G0 = ONE, G1 = TWO, G2 = THREE, G3 = FOUR, G4 = FIVE, G5 = SIX). Open these with a disk monitor (e.g. "G0" for the score ONE) and just change the two byte starting from the hex address $058A to FF FF. The result: "Congratulations, your balance is now 65535 C-Bills." This is enough for an easy start of the game. On several BattleTech fan sites to the game it is reported, that you get pocket money regularly at some certain places in the citadel despite only standing around (e.g. here) (comment from Shmendric: Despite an intensive search I have never found such a Magic Spot, this is possibly only a rumour). Shmendric: "Too many and too easy fights, moderate graphics and they could have made much more role play game plot from the (very good) story. Additionally, there could have been less encounters with hostile Mechs and in return strategically challenging fights and more different Mechs, then the game would have been absolutely perfect. Despite these deficits: I am an absolute fan of theses games, the mixture of strategy and role play game meets my taste." H.T.W: "At first sight, this looks - with the blocky graphics and the jittery scrolling - like a rather loveless conversion of the 16 bit versions, but due to the relatively good story and the (unfortunately to few) interesting quest it gets a good game for people who like this genre." The special editions of the game contained a model of a Phoenix Hawk LAM, which was suited for the BattleTech Table Top Game. The miniture was a special edition and not available in the regular shops. In collector's circles the model is officially named "Infocom Special" Crescent Hawks promotional Phoenix Hawk LAM.. It is a sought-after rarity. In one of the towns you can visit a cinema where there is a slide-show of all anime scenes from the game. 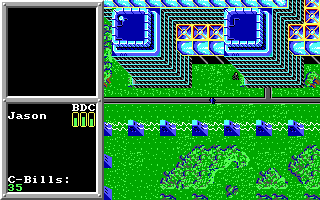 The versions for Atari ST, Amiga, and MS-DOS (VGA/MCGA) only differ slightly from the one on the C64 concerning the quality of the graphics but are of course high-grade. The Apple II by far brings up the rear in this comparison. On the PC no sound cards are supported, the SFXs were realised for the internal speaker poorly rather than well. Due to the long loading times, this conversion is - especially when installing on a hard drive - of course the best. The PC only supports the keyboard in this game, on the Amiga you can also steer with mouse or joystick. The Mechs of the types Javelin and Spider do not appear in the Amiga and PC versions. On the Amiga you get pocket money less often and stock trading is more risky than on the C64. The UrbanMechs, that are supposed to stop Jason from stealing the ArenaMechs, appear in the arena on the C64; furthermore you only need to run through the gap for a successful theft. This is significantly easier compared to the MS-DOS and Amiga version. In these versions the UrbanMechs lure in front of the town and you need to escape from them. Furthermore, only the UrbanMechs in the C64 version have a clutch, but this is extraneous for the game. The Starcache is in a stone desert on the C64 and not on a small island. 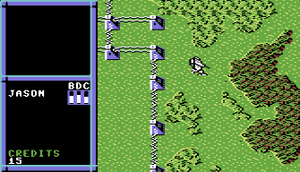 The map of Pacifica is also different on the C64, although it is similar. It seems a bit, as if it was roughly retraced for the C64 version. 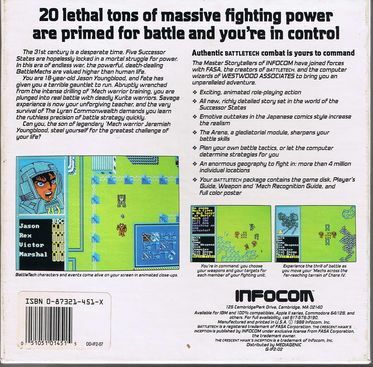 The label of a BattleTech disk (PC version). There is no score and no end evaluation. This page was last modified on 17 February 2017, at 09:01.